Subtitle: This Roman Catholic movie should be the dividing line between Christian leaders standing for enlightened Truth and those leaders deceiving their flocks! 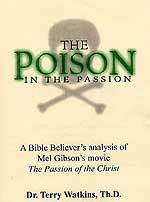 Let us examine the falsehoods being told about "The Passion" so you can see the depth of deception in these Evangelical groups who are mis-leading their faithful followers. 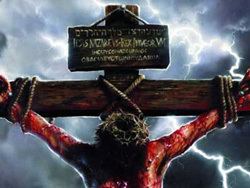 WHY IS ANTICHRIST SYMBOLISM PREVALENTLY SHOWN IN "THE PASSION"- PART 2? 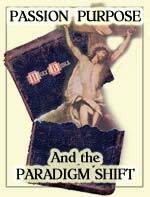 Subtitle: On two occasions in "The Passion", we see Antichrist symbolism. When you understand the symbolism of "Jesus'" naked buttocks in the last scene, you will understand that the movie depicts an Illuminist "signature" in addition to another, more direct, Antichrist symbol. This Article updated 8:40 am EST on 3-3-04 - ANTICHRIST IS PROPHESIED TO HAVE RIGHT EYE DARKENED! 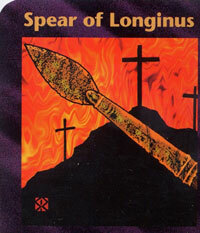 Subtitle: As most of you know, "The Passion of Christ" was released on Ash Wednesday, February 25. 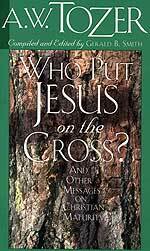 It has been endorsed by Christian leaders such as Billy Graham, Rick Warren [see "Spirit-Led or Purpose-Driven?"] and James Dobson. Could there be any reason for concern? 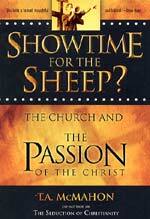 SECULAR EYEWITNESS ACCOUNT OF "THE PASSION"
Subtitle: Baptist pastor was so profoundly "shaken up" for three weeks after previewing "The Passion" that he began to completely change his church to a drastic Ecumenical basis -- including portions of Catholicism, Charismatic, New Age, and Mainline Denominations! Visit the Archives for older articles. You can also E-Mail us if you have any questions about our outreach ministry.